Influencers attract approximately double the engagement of brands on Instagram. Consumers sense a level of authenticity from influencers’ product reviews and trust what products they use. 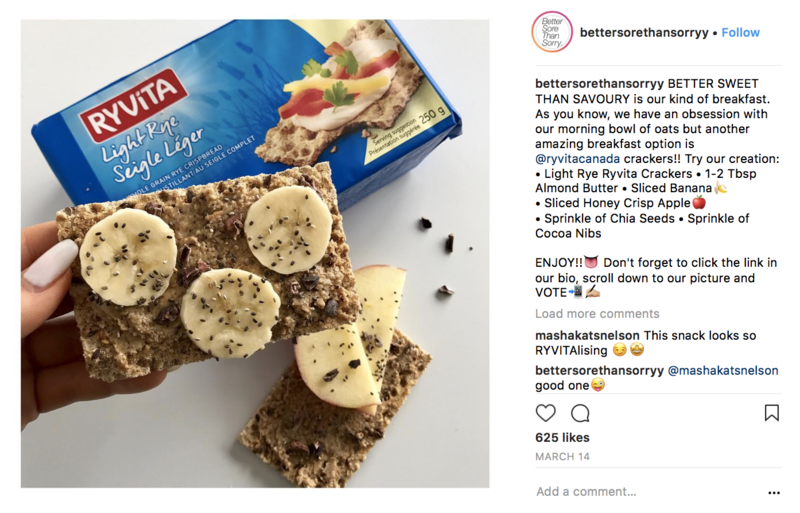 The average micro-influencer engagement rate is about 6%, whereas @bettersorethansorry, an influencer recently used in The Great Ryvita Crispbread challenge, received 27% engagement on their post showcasing the Crispbread. Originating in the East of England, Ryvita Crackers has used the same recipe since the 1930’s. The brand is known for their simplicity, taste, and crunch, which allows for consumers to enjoy crispbread with an array of tasty toppings. Ryvita understood they had to modernize themselves and pivot from their original, traditional marketing strategy . During The Great Ryvita Crispbread Challenge, Ryvita experienced a rejuvenation of their brand and audience through the use of twelve amazing Canadian influencers. By utilizing Socialpeeks top-rated micro-influencer platform and the power of social media, Ryvita targeted users who consider themselves “foodies” and are conscious of their healthy eating options. Strategically, these chosen influencers received a few hundred thousand impressions and grew Ryvita’s own Instagram following by a surprisingly high amount!! This one-month strategy was a long enough campaign to allow for multiple posts to be created and shared, but also instilled a sense of demand and urgency in followers to taste the Crispbread and vote for themselves. Influencers had full creative control over their posts, as they came from a variety of backgrounds ranging from dieticians to students and company founders. Their crafty recipes highlighted the ease of their creation and highlighted how a traditional crispbread can have a tasty and trendy flavour (cough cough avocado toast sans bread). . Followers had the chance to vote on their favorite creation, driving thousands of votes and impressions surrounding the #RyvitaCanada brand name. Ryvita modern twist on their seemingly traditional marketing strategy helped them not only drive amazing results in this 30-day campaign, but has helped them build relationships with social influencers who truly loved crafting the recipes with their product! Find out exactly how Ryvita Canada drove 5,000 contest votes in just 30 days by clicking here to see their results!